And the 39 year old who grew up in South Shields and Northumberland took time out of her busy schedule to deliver an inspiring talk to the cadets from 346 (Tynemouth) Squadron. 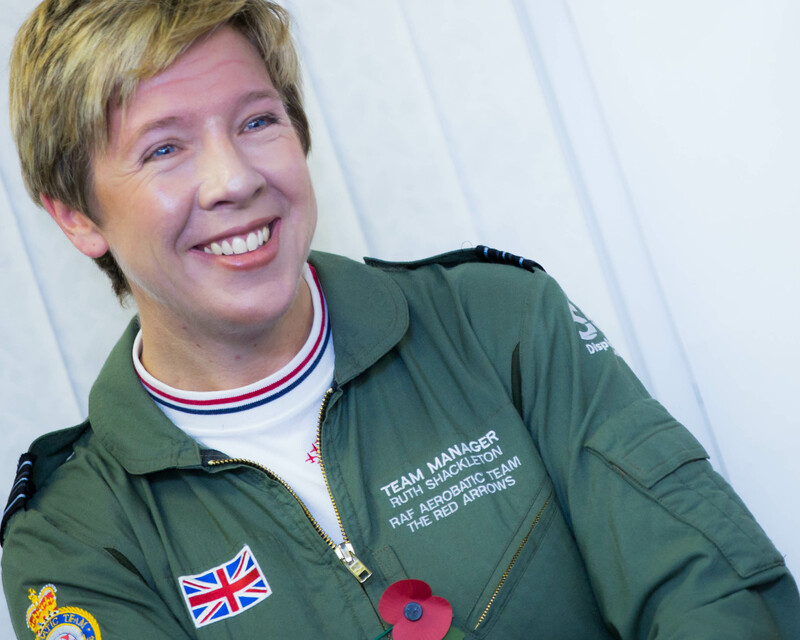 Squadron Leader Shackleton chatted about her rise to the heights within the RAF and her immense pride at managing the Red Arrows during their 50th anniversary year. She also talked to the teenagers about the honour of being the first female member of her school’s combined cadet force – which covers all three military branches – and her slightly unconventional path to joining the RAF in her mid-20s via working on a kibbutz in Israel, for the Jus-Rol pastry company in Berwick and as a flight attendant with Saudi Arabian Airlines. pilots perfect their formations, the important role they play in promoting Britain both at home and abroad and what her job involves. As the team manager, Squadron Leader Shackleton is in charge of co-ordinating everything from where the Red Arrows stay if they travel away to aerobatic shows to how they reach their daredevil displays, organising engineers, photographers and flight planners. But she is now coming to the end of her prestigious two year posting, and indeed her 16 year career in the RAF which has seen her deployed to the Falkland Islands, Kuwait, Afghanistan and Iraq, where she came under scud attack. Squadron Leader Shackleton is planning to leave the aerial warfare service this December and re-join the civilian world. She told her captivated audience of cadets and staff that she had also worked as Duty Operations Officer at 32 (The Royal Squadron) at RAF Northolt arranging VIP flights where she came into contact with a host of famous names from singers Madonna and Robbie Williams to The Queen and Prince Philip. One of the high points had been seeing Nelson Mandela as he arrived in the UK on a State visit. Squadron Leader Shackleton also took the time to inspect the cadets on parade and hear about some of the activities 346 (Tynemouth) Squadron gets involved in from community work to the Duke of Edinburgh Award and training camps. She said of her visit: “I always enjoy meeting young people, especially air cadets. They are the future of our country and potentially they may be inspired to join the RAF. Squadron Leader Shackleton’s visit to 346 comes just over a month after the widow of Red Arrows pilot Jon Egging also chatted to the cadets. The 33 year old Flight Lieutenant was killed when his Hawk T1 jet crashed at the Bournemouth Air Festival in August 2011. Dr Emma Egging spoke about the work now being done in her husband’s memory via the Jon Egging Trust to motivate underachieving youngsters. 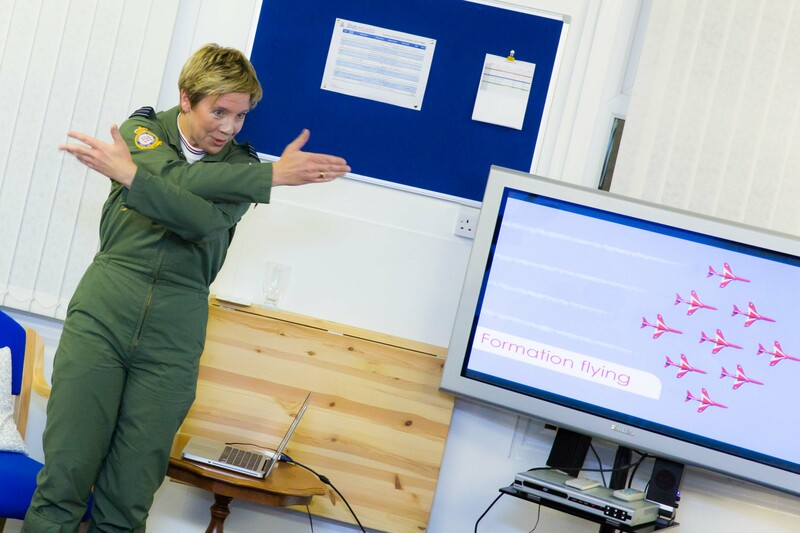 Flight Lieutenant Dan Laidler, Officer Commanding 346 (Tynemouth) Squadron, said it had been a privilege to welcome two such inspirational women to the group’s North Shields headquarters. “It was a great opportunity for the cadets to meet Dr Egging and we’re thrilled that Squadron Leader Shackleton has taken the time to travel back to her native Tyneside too to visit us. “She sets a fantastic example of how a passion for and career in aviation can evolve from being a cadet herself to reaching the top of her chosen profession – especially as in many people’s eyes she would appear to have realised where her true vocation lay quite late in life.